The San Francisco Bay Area Council (SFBAC) established Camp Royaneh as a permanent Boy Scout site along Austin Creek near Cazadero in 1925. The Council purchased the 120 acre Watson Ranch for $17,000. Mrs. Watson was a nurse during the Civil War while her husband was captain of Company F out of Kansas. All of the Watsons are buried at the pioneer cemetery in Guerneville. The name “Royaneh” is an old Iroquois word meaning “Camp of Joy” or “Meeting Place of the Tribes”. Northwestern Pacific steam engine No. 20, which weighed almost 94,000 lbs., carried the boys over the 77 mile journey from Sausalito until 1933 when the line between Duncans Mills and Cazadero was closed. 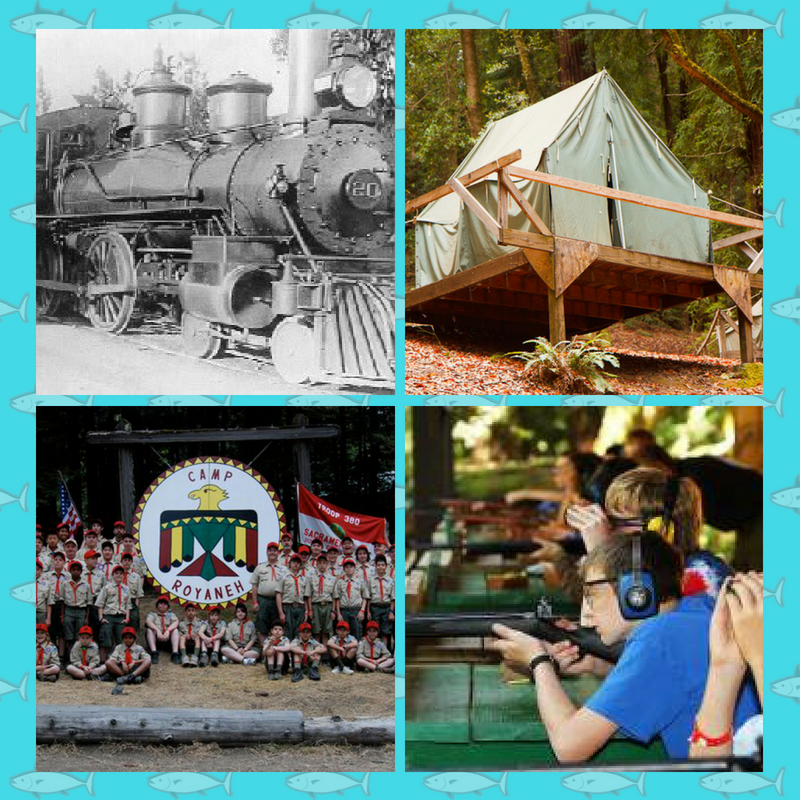 Camp Royaneh is the longest running Boy Scout camp west of the Mississippi River, having served over 100,000 Scouts during its ninety-three year history. Camp Royaneh has a large dining hall, campsites that offer open cabin and tent camping with activities that include a dip in the Olympic-size swimming pool, hiking, canoeing, horseback riding, shooting range, and much more. Pour in the powder, pack the .45 caliber ball and test your skill with a muzzleloader like the ones used throughout the Old West. Don’t forget to test your hand at throwing the “hawks” in the traditional trapper style (don’t try that at home or in the subway or inside a government building). Planning campfires and practicing troop yells are encouraged before arriving. A troop yell will come in handy at the dining hall. Until next time, cheers!